Our 4th newsletter is out! A4BLUE 4th newsletter is out! The A4BLUE project has just entered its third year of project life and its solutions are taking shape; therefore, it is time to disseminate the results obtained in the first two years of activities. Partners are very satisfied with the work performed so far and therefore proud to illustrate the impressive progress that has been achieved in this dedicated newsletter. 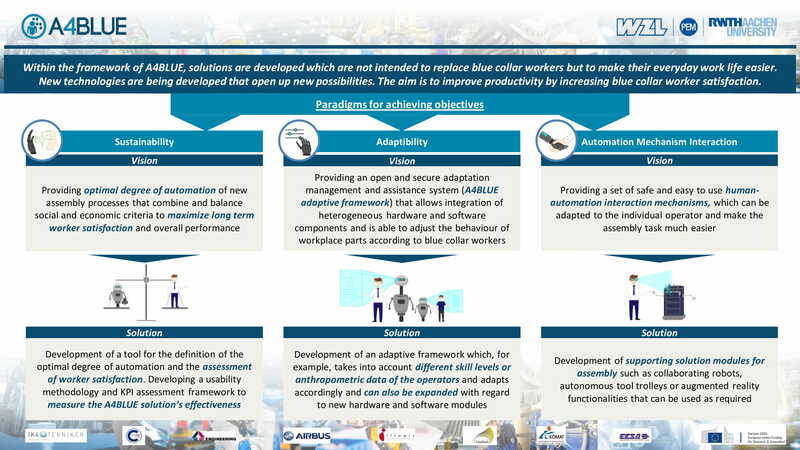 Here you can find details on the implementation of 4 demonstrators for the validation of the A4BLUE solutions which are aimed at introducing adaptive automation mechanisms to help workers execute their tasks in a more efficient and secure way, as well as to provide them with personalized worker assistance systems – including Virtual and Augmented Reality and knowledge management systems – to help them in assembly and training related activities. Our solutions are not intended to replace blue collar workers but to make their everyday work life easier and enhance their work satisfaction via new adaptive workplaces that change and respond to their individual profiles and to the changing manufacturing environments. Our concept, therefore, focuses on three aspects of these new workplaces: Sustainability, Adaptability, and Automation Mechanism for good interactions and collaboration between workers and robots. For further information please, do not hesitate to contact us! ⇐ An autonomous tool trolley that follows the workers: here is the video!